Are cities part of biology? Is London a great big whale? Is Edinburgh a horse? Is Microsoft a great big anthill? What do we learn from that? The pace of life decreases as you get bigger. Heart rates are slower; you live longer; diffusion of oxygen and resources across membranes is slower, etc. The question is: Is any of this true for cities and companies? If you double the size of a city from 100,000 to 200,000, from a million to two million, 10 to 20 million, it doesn’t matter, then systematically you get a 15 percent increase in wages, wealth, number of AIDS cases, number of police, anything you can think of. This 15 percent rule is true no matter where you are on the planet — Japan, Chile, Portugal, Scotland, doesn’t matter. Always, all the data shows it’s the same, despite the fact that these cities have evolved independently. Something universal is going on.What is the reason for this? social networks. The universality is us –that we are the city. Several years ago, Geoffrey West, a physicist and former president of the Santa Fe Institute, together with James Brown and Brian Enquist, started using the powerful techniques developed in physics to think about scaling phenomena to answer related questions in biology. The magic of scaling is that if some characteristics of a system change in a regular way when its size changes over several orders of magnitude, that typically means that there is an underlying “universal principle”. Despite its amazing diversity and complexity, biological life manifests an extraordinary simplicity and universality in how key structural and dynamical processes scale across an immense range of energy and mass scales covering more than 20 orders of magnitude. Almost all physiological characteristics of biological organisms scale with body mass (M) as a power law whose exponent is typically a multiple of 1/4. For example, metabolic rate –the power required to sustain the organism– scales as M3/4. Hence metabolic rate per unit mass decreases with body size, a relationship that implies an economy of scale in energy consumption: larger organisms consume less energy per unit time and per unit mass. The predominance and universality of quarter-power scaling can be understood as a manifestation of general underlying principles that constrain the dynamics and geometry of distribution networks within organisms (e.g., the circulatory system). The self-similar nature of resource distribution networks like the circulatory system, common to all organisms, provides the basis for a predictive theory of biological structure and dynamics. This theory predicts that characteristic physiological times, such as life spans, turnover times, and times to maturity scale as M1/4, whereas associated rates, such as heart rates and evolutionary rates, scale as M-1/4. Thus, the pace of biological life slows down with increasing size of the organism. Sub-linear: scaling ≅ 0.8 characterizes material quantities displaying economies of scale associated with infrastructure, analogous to similar quantities in biology. 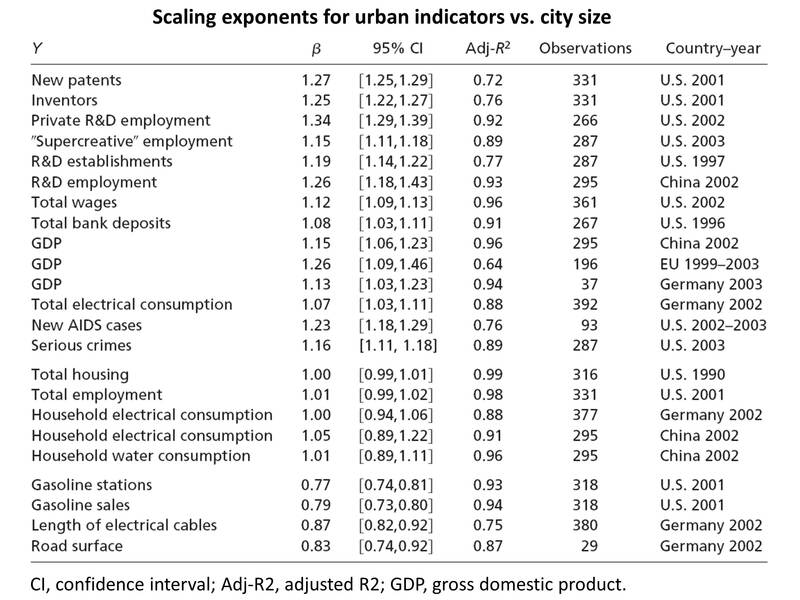 Super-linear: scaling ≅ 1.1–1..3 signifies increasing returns with population size and is manifested by quantities related to social currencies, such as information, innovation or wealth, associated with the intrinsically social nature of cities. The most striking feature is the many urban indicators that scale super-linearly. These indicators reflect unique social characteristics with no equivalent in biology and are the quantitative expression that knowledge spillovers drive growth. Such spillovers in turn drive urban agglomeration and the higher levels of productivity of larger cities. Wages, income, growth domestic product, bank deposits, as well as rates of invention, measured by new patents and employment in creative sectors all scale super-linearly with city size, over different years and nations with exponents that, although differing in detail, are statistically consistent. In order to model the empirical findings, West and his collaborators put forward a simple equation to describe the growth of cities which has both interesting and very disturbing implications. The equation contemplates two fundamentally different, competing, underlying dynamics with key implications in the growth of social organizations like cities: material economies of scale, characteristic of infrastructure networks, vs. social interactions, responsible for innovation and wealth creation. The first one leads to a sigmoidal growth curve, in which growth ceases at large times as the population approaches a finite carrying capacity. This solution is characteristic of biological systems. Social organizations that are driven by economies of scale are destined to eventually stop growing. The situation changes dramatically when growth is driven by innovation and wealth creation. Growth becomes faster than exponential, and leads eventually to an infinite population in a finite amount of time. In practice, the material resources are ultimately limited so the singularity is never reached i.e. unlimited growth is unsustainable. This lack of sustainability triggers a transition to a phase leading to stagnation and collapse. 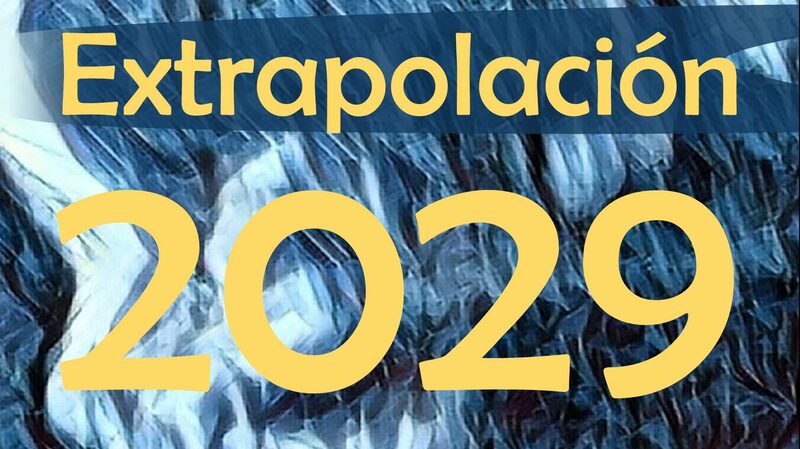 In order to avoid the crisis and subsequent collapse and maintain growth, an innovative response is the only way to restore the predominant dynamic that keeps the city in the ‘‘wealth and knowledge creation’’ phase. However, to sustain continued growth, major innovations or adaptations must arise at an accelerated rate, because the time between “crisis” shortens as population grows. Something that took 10,000 years 20,000 years ago to make a change, now takes 25 years. There’s a clock that’s getting faster and faster. And so you have to innovate faster and faster in order to avoid the collapse. After cities, Geoffrey West turned his attention to companies, wondering if it was possible to take the same ideas and do with corporations what they have done in biology: Can we understand the birth and death of companies? how do they stimulate the economy or how are they related to cities? How does it affect global sustainability? When West started to work, he thought that companies would be like cities, that they would be dominated by creativity. They first discovered that there’s much more variation, many more outliers among companies than there are among cities. Nevertheless, there is clear evidence of scaling. However the scaling they found was like the one in biology, not in cities. It was predominately sub-linear. Companies are dominated by economies of scale rather than innovation. We looked at the growth curves as the metrics of the company, like its assets or its profits, as a function of time, or its number of employees as a function of time. Indeed, the generic behaviour is a sigmoid. They grow fast and they stop. All the big companies stop at roughly the same value, which is intriguing of it self. I think that number is about half a trillion dollars. The great thing about cities is that as they grow their dimensionality increases. That is, the space of opportunity, the space of functions, the space of jobs just continually increases. And in fact, one of the great things about cities is that it supports crazy people. You walk down Fifth Avenue, you see crazy people, and there are always crazy people. Well, that’s good. It is tolerant of extraordinary diversity. This is in complete contrast to companies, with the exception of companies maybe at the beginning. Most companies start out probably with some of that buzz. But the data indicates that at about 50 employees to a hundred, that buzz starts to stop. Indeed, if you go to General Motors or you go to American Airlines or you go to Goldman Sachs, you don’t see crazy people. Crazy people are fired. Well, to speak of crazy people is taking the extreme. But maverick people are often fired. It’s not surprising to learn that when manufacturing companies are on a down turn, they decrease research and development, and in fact in some cases, do actually get rid of it, thinking “oh, we can get that back, in two years we’ll be back on track.” This kind of thinking kills them. This is part of the change from super linear to sub-linear. Companies allow themselves to be dominated by bureaucracy and administration over creativity and innovation, and unfortunately, it’s necessary. You cannot run a company without administrative. Someone has got to take care of the taxes and the bills and the cleaning the floors and the maintenance of the building and all the rest of that stuff. You need it. And the question is, “can you do it without it dominating the company?” The data suggests that you can’t.